A view o the Golden Gate Brig frae the Marin Heidlands in Januar 2007. San Francisco, Californie an Marin Coonty, Californie, U.S. The Golden Gate Brig is a suspension brig spannin the Golden Gate strait, the mile-wide, three-mile-lang channel atween San Francisco Bay an the Paceefic Ocean. 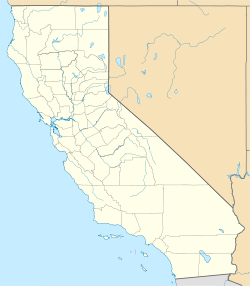 ↑ "Golden Gate Transportation District". 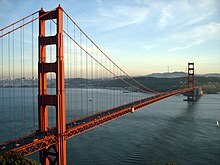 Goldengate.org. Retrieved June 20, 2010. ↑ "Annual Vehicle Crossings and Toll Revenues, FY 1938 to FY 2011". Golden Gate Bridge, Highway and Transportation District. Retrieved December 23, 2012. ↑ "Golden Gate Bridge". Office of Historic Preservation, California State Parks. Retrieved 2012-10-08. ↑ "City of San Francisco Designated Landmarks". City of San Francisco. Retrieved October 21, 2012. This page wis last eeditit on 11 Mairch 2018, at 00:43.